New Users can be added by an Admin User of the Account. 1. Click Admin from the top tool bar. 2. Select Manage Users from the drop down. 1. Complete the users details, usernames must be unique to the product not just your account therefore we recommend using an Email Address as the username. 2. The Homepage is the first screen the user is taken to when they log in, we recommend Home as this is where we will post important messages. 3. Instance is the account the user will log into, please do not change this as it may mean the user cannot log in. 4. All users should use the default skin. 6. 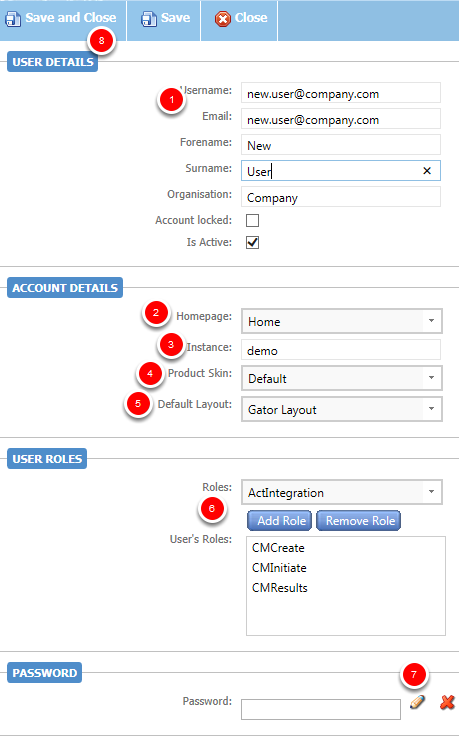 Assign roles to the user by selecting them from the drop down and clicking add role. For a standard user they would have CMCreate, CMInitiate and CMResults. It is possible to limit a users access on a tab by tab basis, if you wish to do this then the user must have the role BaseLogin and then a role for all the tabs you would like them be able to access. 7. Create the user a password by clicking the pencil icon. 8. Click Save and Close to finish.